Home » Who Will Be COY? Who Will Be Captain of the Year? This year we have had a lot of weather delays, but in spite of that we have also had a good turnout for the club tournaments. 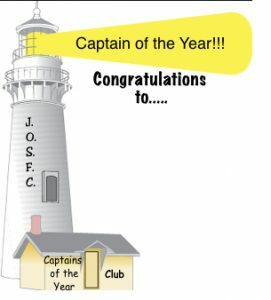 In fact going into June, there are 10 people that all have a chance at winning the coveted Captain of the Year Trophy! Think about it, for 59 years the club has had an average of about 300 members ( 59 X 300 = 17,700 fishermen and women. ) and currently there are only 58 people in the entire world that can claim the title of the “Jacksonville Offshore Sport Fishing Club Captain Of The Year” !!! With the last tournament held on May 12th being the May Trolling Tournament we have had the points spread narrow drastically. You know one of these days the weather people are going to get it right. Once again on Saturday May 12th the club hosted its May Trolling Tournament with 12 boats fishing. The weather was calling for 2 to 3 ft swells at 9 second intervals. Well it was 2’ to 3’ with occasional 4’ but definitely not 9 seconds more like 3 seconds. The winds were out of the Southeast. This made for a bumpy ride all day. In honor of the Sailfish Pot Party that was that evening, the weigh station was opened at 1:00PM with half of the group weighing in by 2:00 to 2:30 PM. Kings are on the beach and over the wrecks. There were even some Blackfin Tuna and Barracuda brought in for weighing. Like I said above, the Captain of the Year Board is now heating up. Every fish counts and every tournament has meaning at this time of the year. The following points spread show the results after the May Trolling Tournament held on the 12th. There are still 4 Club Tournaments left for this year. That is 40 first place points that are still up for grabs. Even 4 second or third place finishes could earn enough points to boost the last place people to first! Get our there and have some FUN! Our next tournament is the JUNIOR Angler Tournament ( Kids have to catch the fish. ) It is scheduled for June 23rd. Not a member but want to fish it with your kids? Not a problem, all our Tournaments are open to the public. Click on the box on the home page titled ” Our Next Meeting” for more information.